Thank you for making this such a brilliant year. See you in 2019! 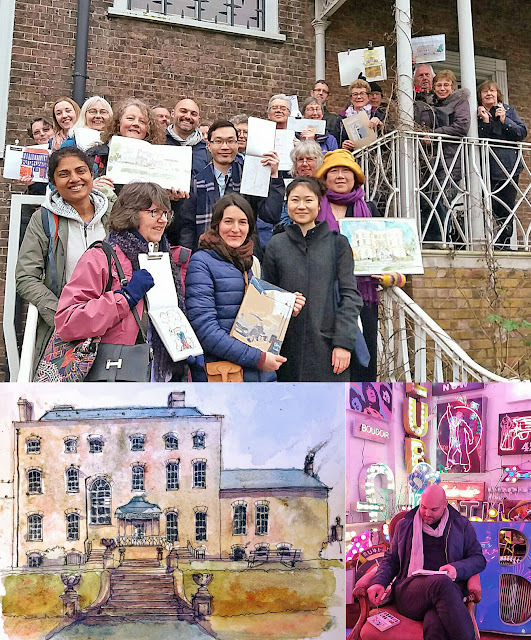 Let's draw London in 2019! John Webb writes: I make two cakes each year - one for us, one for my wife's cousin. 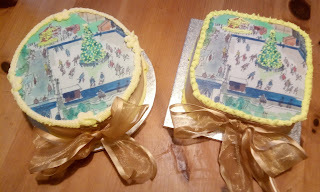 Each year decoration is a challenge but last Christmas' USk London at the V&A looking down to the Ice Rink at the Natural History Museum has come to the rescue. 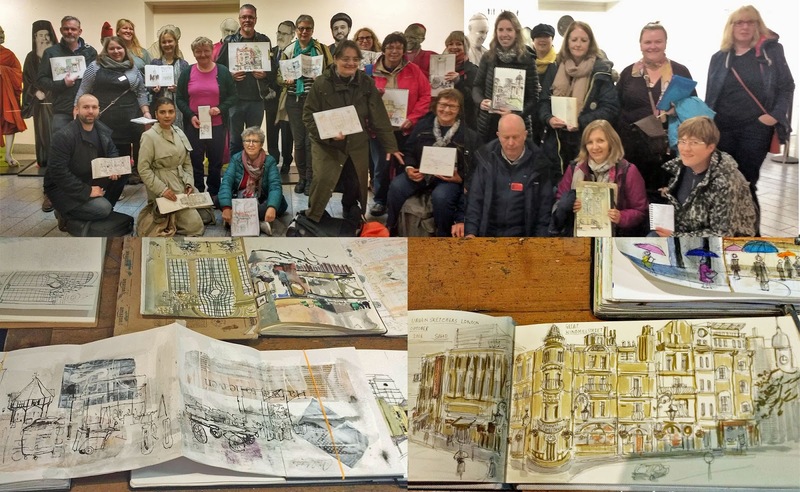 Thank you Urban Sketchers - and Happy Christmas everyone! Our venue this month is the Royal Air Force Museum, in Hendon. 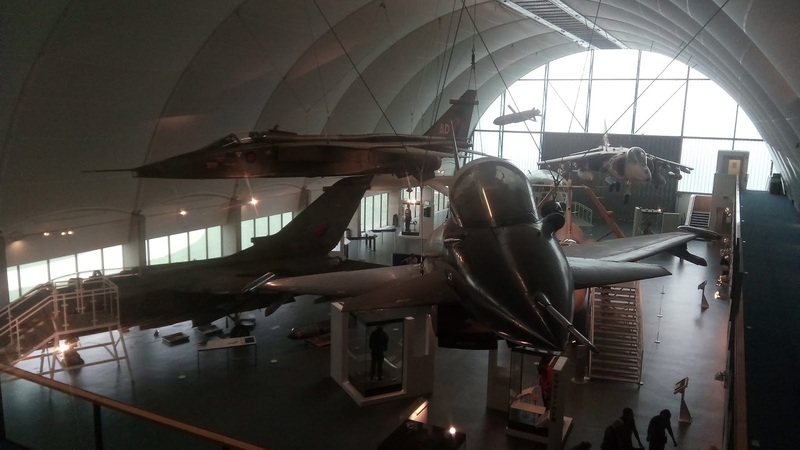 The museum tells the history of military aviation from before the RAF was founded in 1918 through to modern times, with a look forward into the uncertain future needs. It provides the opportunity to draw the buildings (both new and some of the original Hendon Aerodrome buildings) exhibits and visitors. There is no charge for the event, and no need to book, just turn up with your drawing gear. 11 am: We will meet in the museum’s main entrance area which is in Hangar H1 under the starboard (right) wing of the Sunderland flying boat (picture below). This is to the left as you enter. 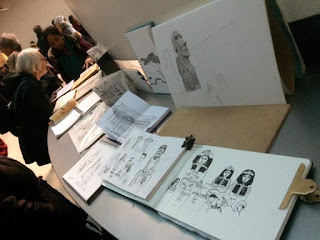 1 pm: We will meet there again at lunch at 1pm and look at sketches done so far. There is a café there too. 3.30 pm: Finally, we will meet there again to look at sketches done and take photographs. 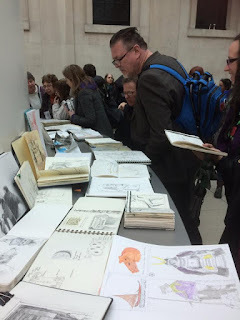 Thence using the café for post sketching conviviality and sketchbook sharing. The museum is on part of the old Hendon Aerodrome. 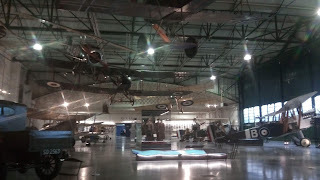 It is a large area with the exhibits in six hangars (3, 4 and 5 in the old main building, pictured above). 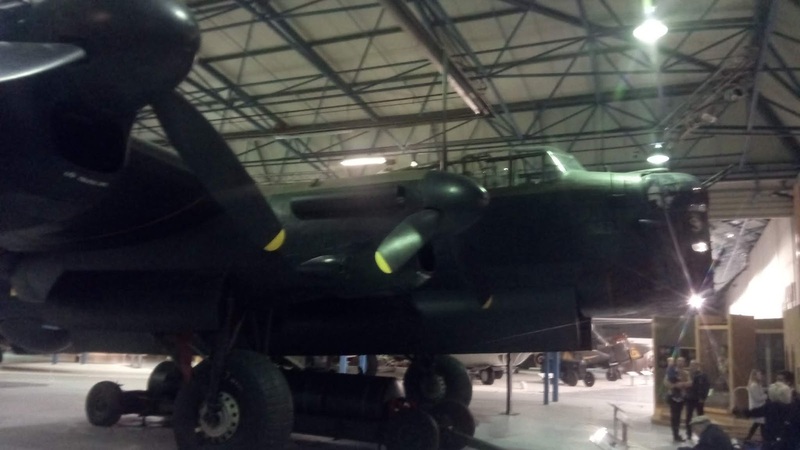 Whilst the exhibits which dominate are the aircraft, there is a huge variety of other items from small models, medals, uniforms, cars to a couple of boats. Entry to the museum is free. Expect a bag search on entry where you can collect a useful map (suggested donation of £1 or print from their web site free). The museum has not given us any rules about art materials which can be used, but please be cautious when using anything that might spill, splash or crumble. Be aware also that you will be drawing among many visitors, so try not to cause an obstruction. Getting to the museum is quick and easy - just 30 minutes from Central London by Tube, and a seven minute 303 bus ride from Colindale Underground Station. By road the museum is only 30 minutes from Central London. Follow the brown and white tourist signs from M25, M1 (Junction 4 Southbound), A41, A5 and North Circular (A406) roads. There is parking on site, parking charges apply (£3 for 3 hours, £4 for 3 – 6 hours). The postcode NW9 5QW will direct you to the small industrial estate that is located next to the Museum. Their web site notes that during periods of high demand such as the school holidays and weekends this can fill up very quickly. We would therefore suggest that during such times that you leave your car at home and use public transport. There are toilets and several cafés in the museum buildings. The museum’s website has further information. The day is run by John Webb and Philip Stones. 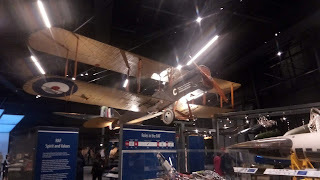 The photographs and sketch of the Blériot are by John Webb. Urban Sketchers London drew at the British Museum on Saturday 15 December 2018. 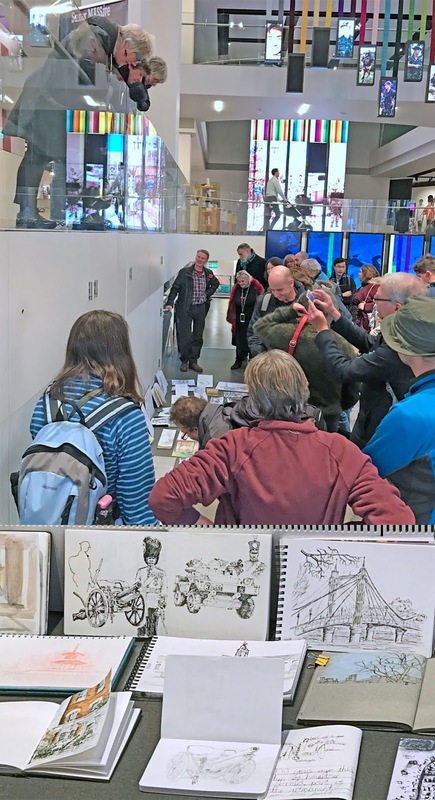 We explored the museum collections, tackled the challenge of drawing the museum's spectacular glass roof, and sketched some of the many visitors. 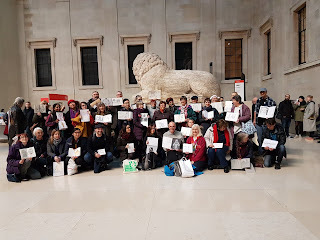 On a cold, wet day, we also discovered urban sketching luxury - the museum's Great Court has underfloor heating! In the afternoon, some of the group also visited the Petrie Museum of Egyptian Archaeology in nearby Malet Place; the sketch below is by Isabel Carmona. 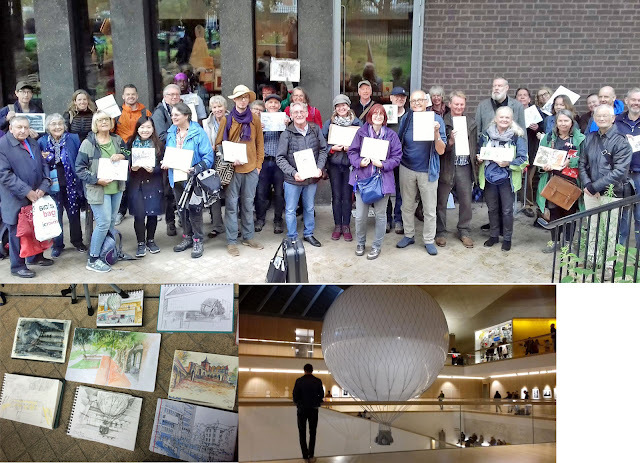 Our next meet-up is Sunday 27 January 2019, when we will draw at the Barbican. We hope to see you there. Photographs are by Isabel Carmona, Nicky Browne and Jo Dungey. We start 2019 with a visit to the Barbican in the City of London, which is one of the most remarkable examples of Brutalist architecture in the country. 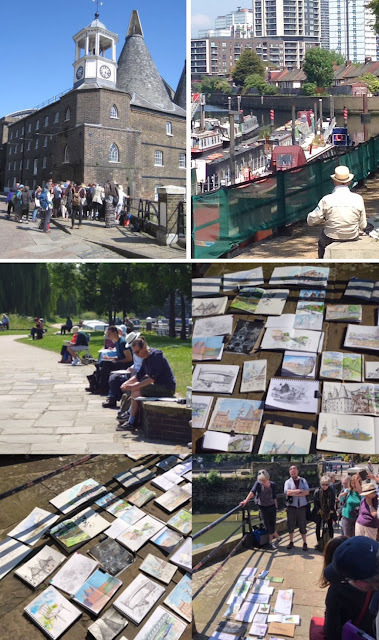 Please note that unlike most of our sketchcrawls, this one will take place on a Sunday. This is because Sunday is the only day of the week that the Barbican Conservatory is usually open. The day is free of charge, and there's no need to book. Just turn up with your own art kit. 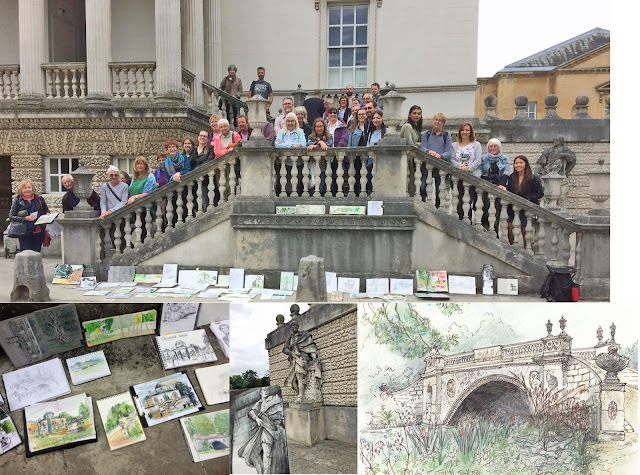 3.30pm Meet on Lakeside Terrace (or just inside if wet) to share sketches and take an end of day photograph. 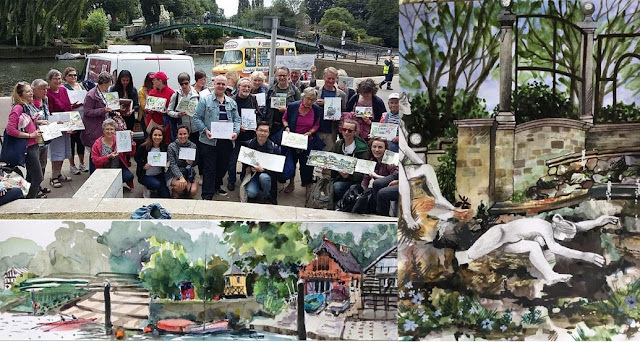 We can sketch the residential buildings, inside and outside the Arts Centre, the Museum of London, St Giles' Church and the St Alphage gardens and highwalks. Since it is a Sunday the Barbican Conservatory may also be open. This is the second largest conservatory in London and can be found on level 3 of the Barbican Centre, although there is a possibility that it will be closed for a private function. More information about that should be available on the day. The Barbican Centre is open from 9am - 11pm and this floor plan shows the layout of the Arts Centre. There are cafes, toilets and lots of seating throughout the Barbican Centre. There is also a cafe attached to the Barbican cinemas on Beech street, as well as a Waitrose and Pret a Manger on nearby Whitecross Street. The nearest underground stations are Barbican and Moorgate. Old Street, St Paul's and Liverpool Street stations are a short walk away. Bus 153 also runs right past the Barbican Centre along Chiswell Street, and other buses stop nearby. See the TFL website for more information. Access maps on the Barbican wesbite show the route to the Barbican centre (with photos) from nearby stations. For more information see the Barbican website. The day is run by Cathryn Worrell and Gafung Wong. The London Sketch Club- founded in 1883! They used to call themselves "black and white artists", drawing from life in the studio and on location and exhibiting at their club. I feel very curious and inspired, hope to visit their open exhibition one day. My own sketch I had to improve later with some watercolour, adding details and full street address. 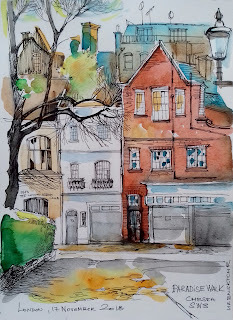 The London sketch club is also in the picture, just a fragment of the building. Draw London with us in 2019. This programme of events is provisional - each month details will be posted on this blog about the next month’s event. This will give information about the location, including where and when to meet. These events are free of charge and there is no need to book. Just turn up and bring your own drawing kit. The Urban Sketchers London sketchcrawl programme is co-ordinated by Jo Dungey and Lis Watkins. 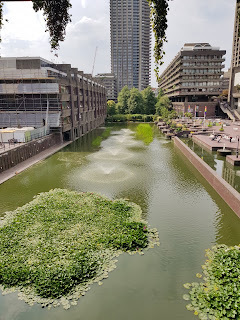 We start 2019 with a visit to the Barbican. A cultural hub within the City of London, the Barbican estate is one of the most remarkable examples of Brutalist architecture in the country. Sketch the residential buildings, St Giles Church, the interior of the arts centre, the Museum of London and St Alphage high walks and gardens. Note we are meeting on a Sunday this month. 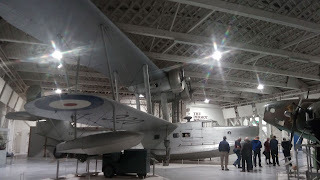 Our venue this month is the RAF Museum, in Hendon. The museum tells the history of military aviation from before the RAF was founded in 1918 through to modern times, with a look forward into uncertain future needs. 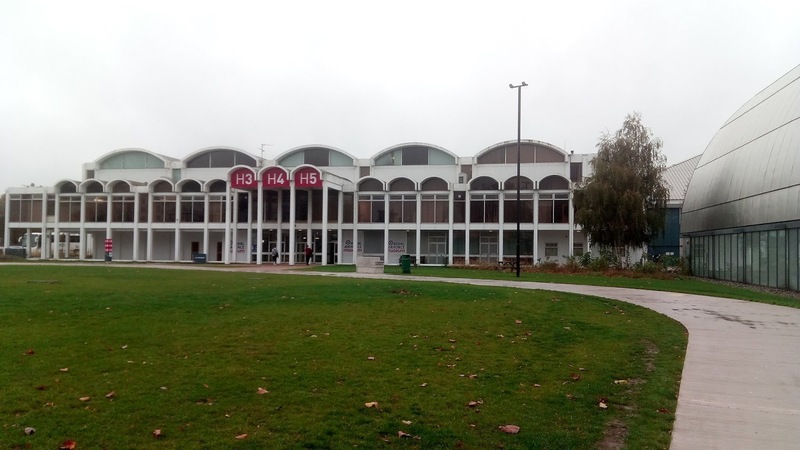 It provides the opportunity to draw the buildings, both the new ones and some of the original Hendon Aerodrome buildings, the exhibits and the visitors. In March we meet to sketch in and around Spitalfields. Spitalfields has a wide range of subjects to draw. It has some of London's most complete Georgian streets. There is an interesting market surrounded by shops and cafes, and a modern pedestrianised area with sculptures. 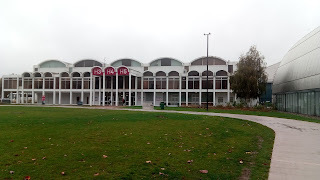 An important landmark in the area is Christchurch, designed by architect Nicolas Hawksmoor. We visit Croydon in April, which has a wealth of different styles of architecture and lots of interesting people to draw. 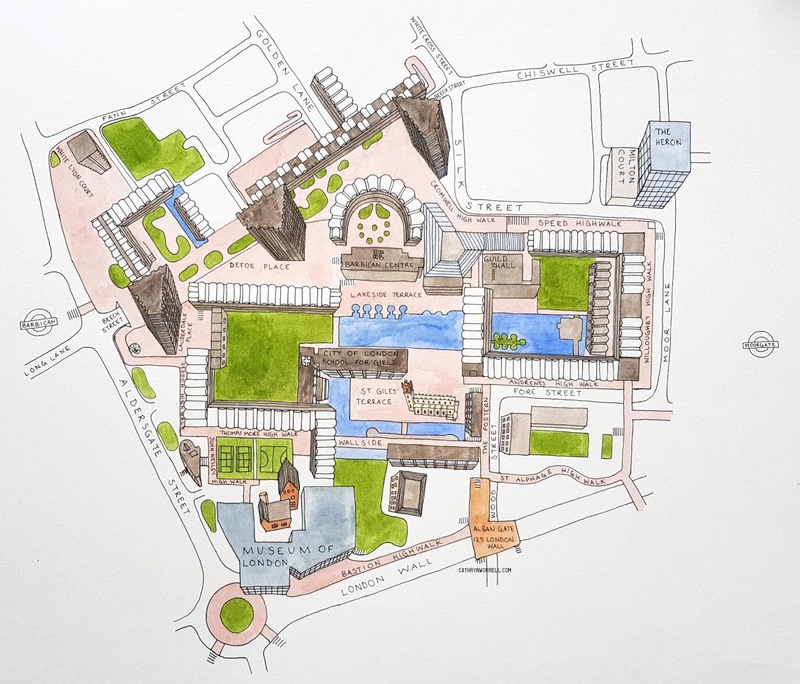 From Brutalist buildings and tall tower blocks near East Croydon station to the old town where there are old alms-houses, a castellated water pumping station and the historic Minster. A busy town centre has lots of shoppers on a Saturday too. In May we explore Dulwich Village in South London. Dulwich Picture Gallery was founded in 1811, as England’s first purpose-built public picture gallery, designed by Sir John Soane. There are many other interesting buildings - some beautiful Georgian houses, the Old Grammar School, churches, a big old pub, some alms houses - set in a leafy environment. 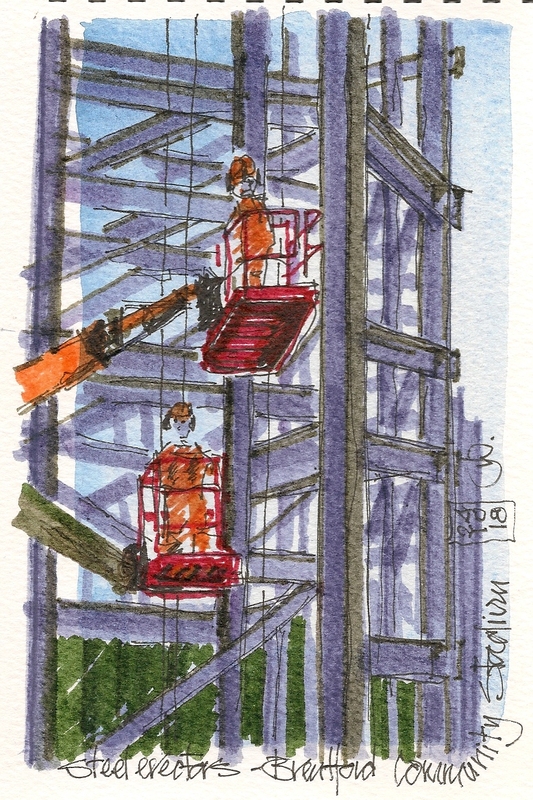 Dulwich Park offers other sketching opportunities. Our visit coincides with the opening weekend of the Dulwich Festival which includes many Artists’ Open Houses. This month we return to Richmond, a town full of interest, with its riverside, boats and bridges. Or, if you prefer buildings, you could draw the remains of Richmond Palace, built by Henry VII, or the town's 20th Century version of Venetian Gothic on Bridge Street. And if we are lucky there will be a farmers’ market too. Richmond has good transport links, with the District Line, and frequent trains from Waterloo. This month we draw the South side of Regent’s Park, it’s gardens and parkland. This offers the opportunity of many colourful subjects, including the fountains and formal flower beds of the Avenue Gardens. Nearby, the fragrant Queen Mary’s Gardens have approximately 12,000 roses, which we hope will be in full bloom for us. The park also has a boating lake, many open green spaces, trees and people at play, sport and leisure. 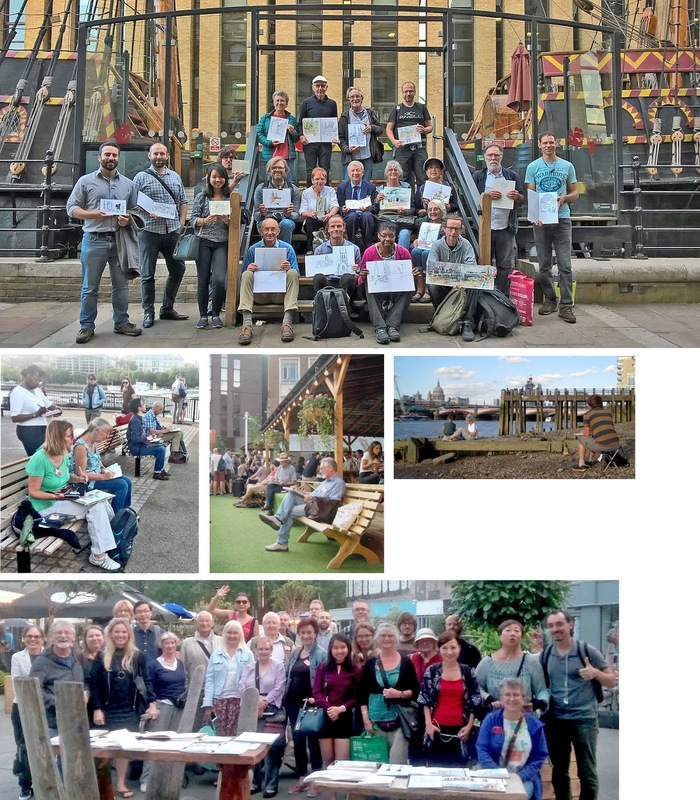 In August we spend time drawing in Greenwich and Island Gardens. Historic Greenwich offers endless drawing opportunities: old pubs, Greenwich Market, the Old Royal Naval College, St Alfege Church (architect Nicholas Hawksmoor, completed 1714) and the National Maritime Museum. Greenwich is also a great location to draw the changing skyline of Canary Wharf. An alternative view of Greenwich is offered, drawing from Island Gardens, across the river. The Greenwich Foot Tunnel, opened in 1902, runs beneath the river Thames between Island Gardens, on the Isle of Dogs, and Greenwich, with an entrance next to the Cutty Sark. We visit Trinity Buoy Wharf is on the north bank of the Thames, across the river from the O2 in North Greenwich. It has spectacular river views of the eastern part of the Thames. Trinity Buoy Wharf was established in 1803 as a Thames-side workshop for Trinity House, responsible for buoys, lighthouses and lightships. 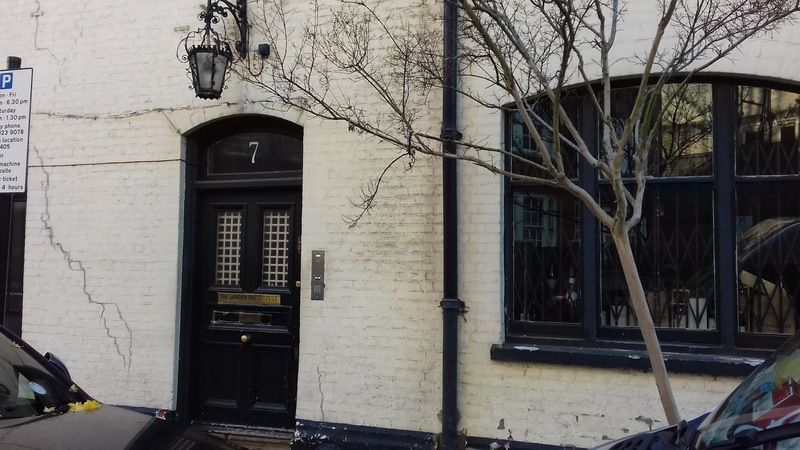 It now preserves some of its old buildings as homes for creative industries including The Big Draw, and has outdoor sculpture displays, studios, schools, cafes, a pier, and London’s only lighthouse. These old industrial buildings contrast with contemporary housing developments. 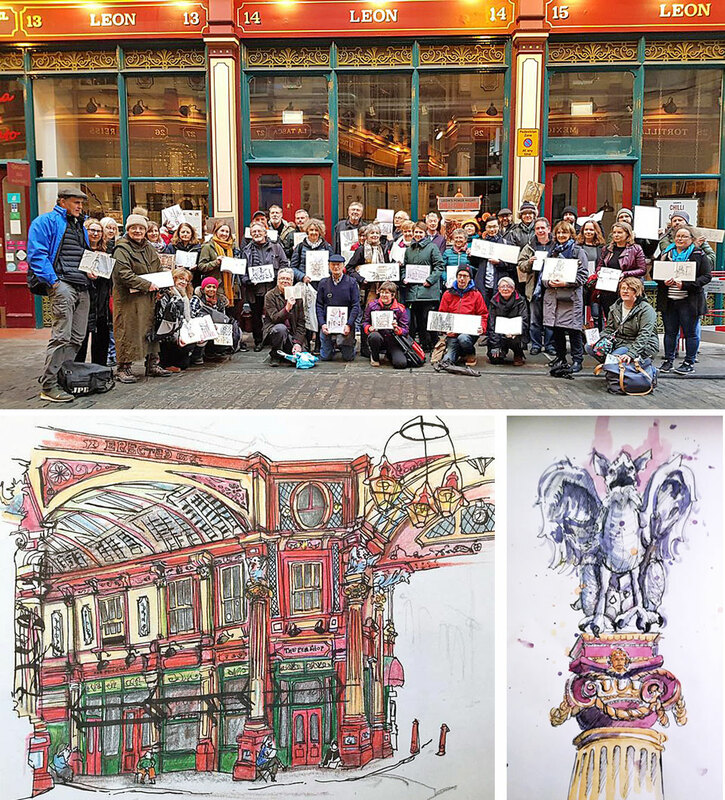 In October 2019 we meet to draw in the City of London, a location combining old and new architecture in different styles. We can draw some of the major City buildings: the Mansion House, the Bank of England, the Royal Exchange, and nearby modern buildings such as No 1 Poultry. There will be a chance to sketch outside and inside the Guildhall Museum, the Guildhall Great Hall and Guildhall Yard. In the same area there are fine examples of Wren’s architecture: St Lawrence Jewry, St Stephen Walbrook (which has a Henry Moore altar) and St Mary-le-Bow. 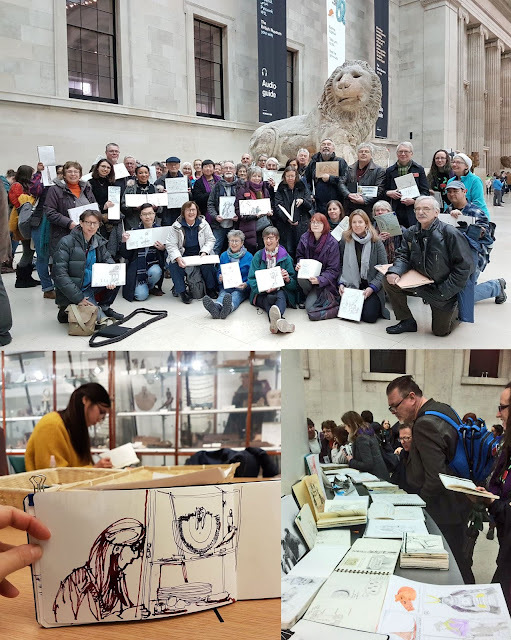 Join us in November 2019 at St Pancras to sketch the British Library and the Francis Crick Institute. 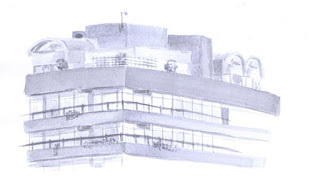 The British Library's St Pancras building - grade I listed, and the largest public building constructed in the UK in the 20th century - is a delight for any artist to sketch. It's a busy hub for students, researchers and readers and it has many significant things to draw. In the middle of the building is a six-storey glass tower containing the King’s Library, with 65,000 printed volumes collected by King George III and given to the nation, a very spacious and visually pleasing atrium, reading rooms on different floors, and the Centre for Conservation. There are exhibitions, some free, some ticketed. Outside, the entry gate is designed by Lida and David Kindersley and the piazza has large sculptures by Eduardo Paolozzi (a bronze statue based on William Blake’s study of Isaac Newton) and Antony Gormley. Nearby buildings include St Pancras Station and the new Frances Crick Institute which has a public gallery. 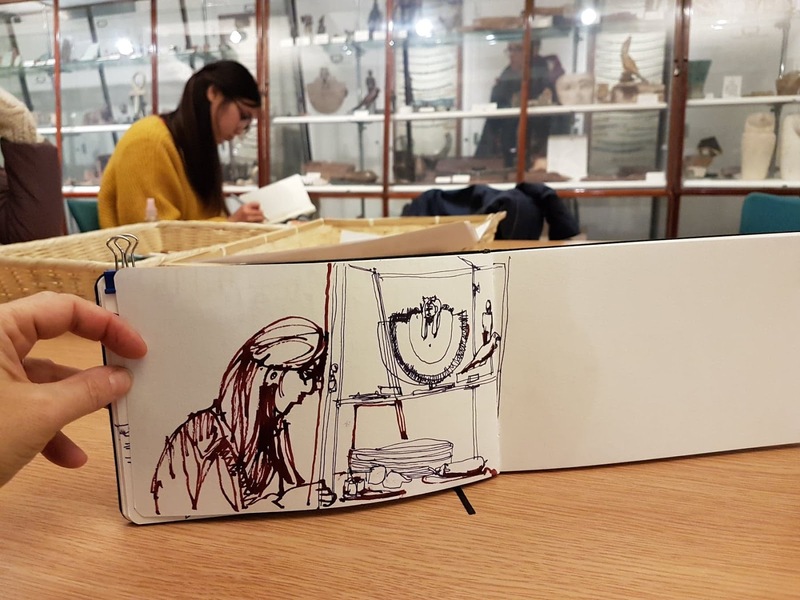 December finds us warm and dry, drawing at the Natural History Museum in Kensington. This spectacular Victorian building was designed by Alfred Waterhouse and has ornate terracotta facades inside and out. A sculpture of Charles Darwin presides over the main hall, which now features a skeleton of the blue whale. The collections include 80 million specimens including wildlife and geology in an extraordinary “cathedral of nature”. In December the museum's front garden is transformed into a magical outdoor ice rink. We visit Bloomsbury and the British Museum this month. We can draw aspects of the British Museum building, including the Great Court. The treasures of the British Museum are unrivalled, and we can also sketch visitors and the life of the museum. 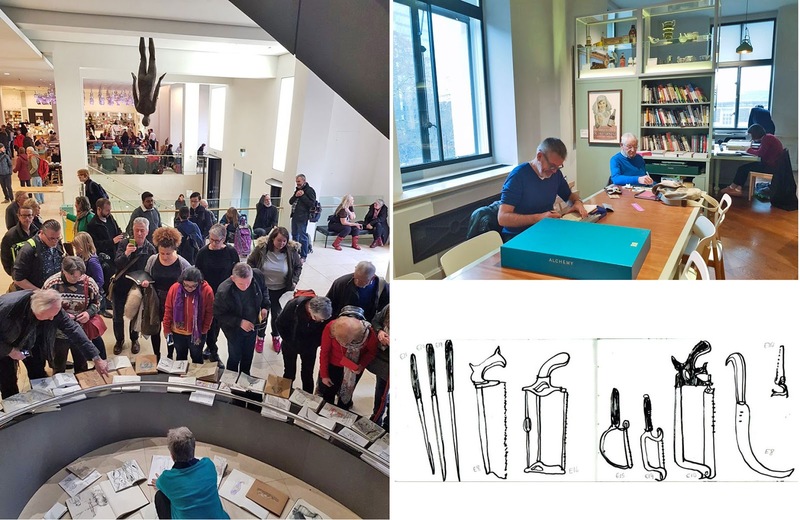 Bloomsbury is also home to several smaller museums, and in the afternoon there is an option to draw at the Petrie Museum of Egyptian Archaeology. There is also the possibility to explore the historic squares and streets of Bloomsbury. 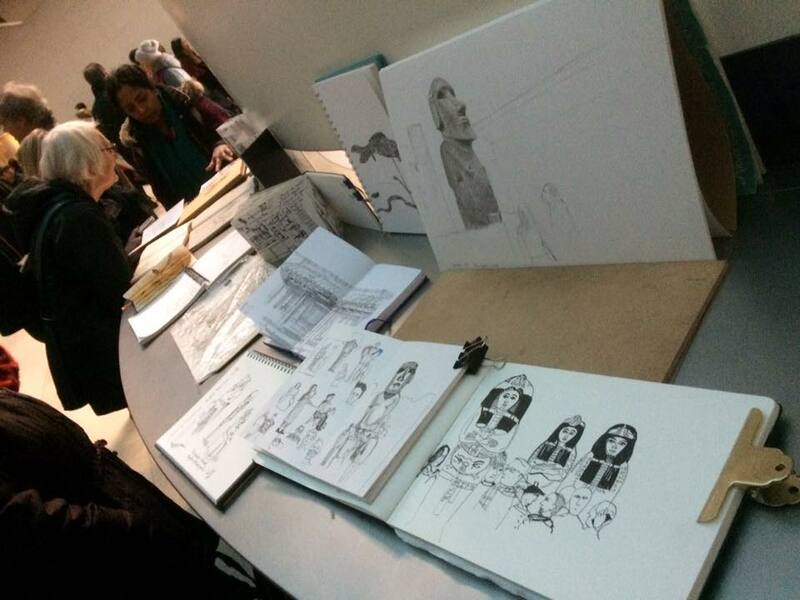 1pm: Meet in the Great Court near the Information Desk to look at drawings done so far. 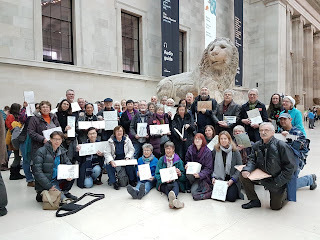 3.30pm: Meet at the same place to look at drawings done and take group photographs. The British Museum building was designed by Robert Smirke in 1823, and originally housed the British Library as well as the British Museum collections. The Great Court – the largest covered square in Europe – opened in 2000, architects Foster and Partners. At its centre is the Reading Room, dating from when this building was also the British Library. The galleries display a vast collection of antiquities and art works from all over the world. 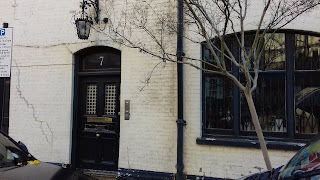 The Petrie Museum of Egyptian Archaeology is part of the University of London. It is on Malet Place and open from 1pm to 5pm. It has an extensive collection, displayed in a traditional style and a quiet environment. The museum has suggested it would be suitable for about ten sketchers to visit to draw at any time. 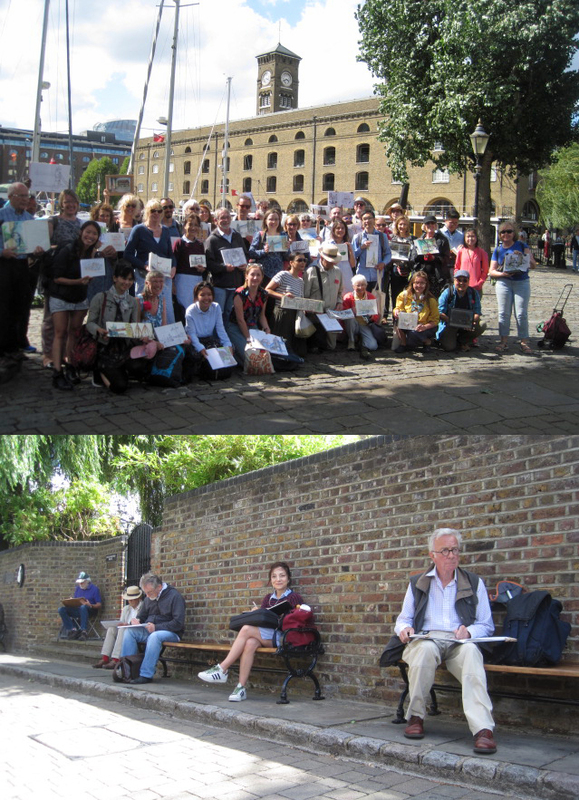 The area also offers outdoor sketching opportunities, for example in nearby Bedford Square and Russell Square. 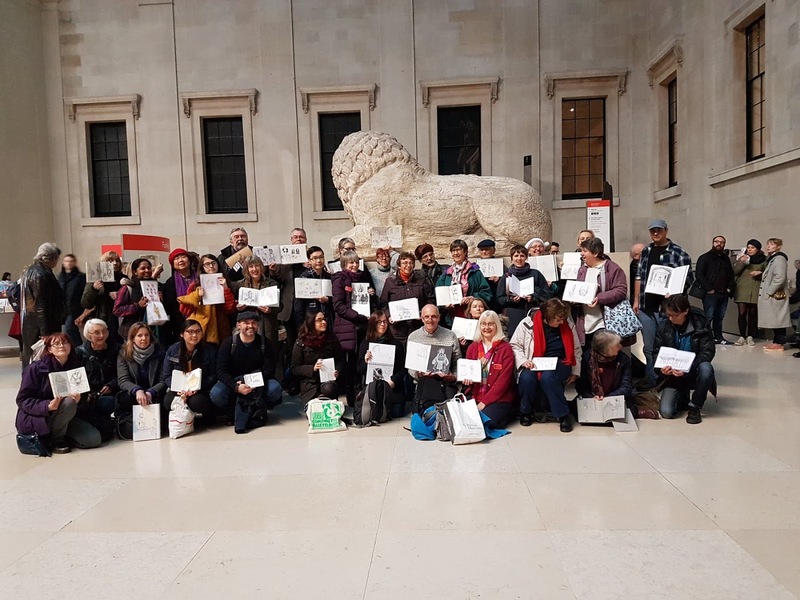 The main entrance to the British Museum is on Great Russell Street, but we are meeting at the Groups Welcome Desk inside the rear entrance on Montague Place. Expect a bag search at either entrance. The nearest underground station is Tottenham Court Road (Northern Line and Central Line) or Russell Square (Piccadilly line). The British Museum galleries are open from 10am to 5.30 pm, and the Great Court opens from 9am to 6pm. There are cafes both inside the British Museum and nearby, and public toilets, and cloakrooms, all of which are signposted. Admission is free of charge, other than for special exhibitions. The Petrie Museum is on Malet Place, a pedestrianised road running north/south, opposite the Waterstones bookshop on Torrington Place. The Petrie Museum is only open in the afternoon: 1pm to 5pm. It is free of charge. It has toilets but no other facilities. Both museums have restrictions on art materials which can be used: pens and pencils can be used, but not paint or dusty materials such as charcoal. [John Webb] Brentford Football Club have just lost their reasonably effective Head Coach to rivals Aston Villa, replaced by his assistant. Result, a plummet down the Championship table. However our new stadium rises up spectacularly just north of Kew Bridge. The steel frame for the South Stand is complete and work has started for the terraces of the east and west stands. It will soon be revealing the skeleton shape of a stadium. 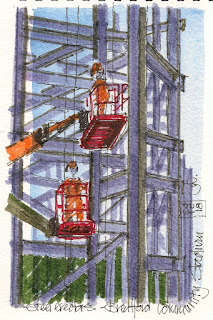 I have just completed 4 more progress sketches - other 3 on Facebook - this one a couple of cherry pickers/steel fixers at the corner of the South Stand where it abuts the road. It is close! I had just finished and was leaving when I saw this 'stop me in my tracks' geometric contre-jour. Watercolour wash; marker pen/brush drawing.